This is a great grain salad. It’s got everything you need! Quinoa is packed with protein, but still has the starchy taste of a grain, the vegetables add fresh flavor and color and vitamins, feta and olives add to the whole Mediterranean deliciousness, and herbs make it fresh and summery. I expect I’ll be making this a lot more this summer. It’s easy to make, great for potlucks, picnics, or lunches. The flavor is a little subtle, which I found to be a great refreshing taste, but if you want to kick it up a notch, add more feta and/or olives, or herbs, just taste as you go (remembering that it’ll come together more the longer it sits). I can also picture this being a great tomato filling for later in the summer, just leave out the grape tomatoes and stuff a large tomato with this salad for a pretty presentation. In a large saucepan, add quinoa over high heat. Toast the quinoa, stirring the pan frequently, until fragrant and starting to pop. Carefully add water and salt, reduce heat to a simmer. Cover the pot and let cook for about 20 minutes, or until all the water has been absorbed. Meanwhile, in a measuring cup, whisk together the rice vinegar, olive oil, lemon juice, dill, mint, salt and pepper. Once the quinoa is done, pour about half of the dressing over the quinoa and mix well (adding it to the hot quinoa will allow the quinoa to better absorb the flavors). 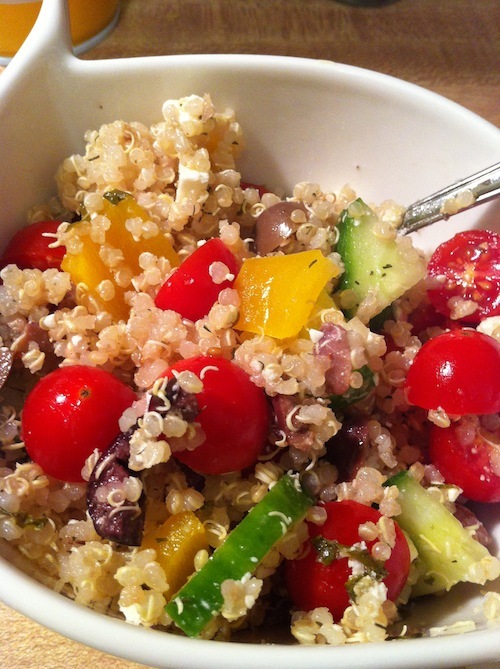 Allow the quinoa to cool partially, then add the remaining ingredients, and top off with the remaining dressing. Mix well and serve room temperature or cold.